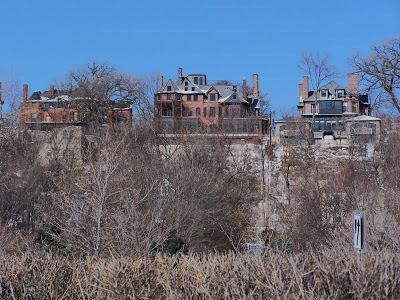 During the summer months, it is pretty difficult to see the rear of the mansions on Summit Avenue in Saint Paul due to all the trees and leaves. But in the winter, if you walk behind the hospital off of Grand and Smith, you can get a really good view of what these homes look like. It makes them all that much bigger in real life. 2 comments… Join the conversation and add your own! A beautiful photo which could have been taken a century ago. Thank you for sharing. I drive this route every day from my home in Crocus Hill to the downtown hospitals and especially enjoy the winter vista. Yes, in winter you can see everything hidden in the summer. I really wish I could have seen the area, when the carriage houses were still there and used.